There’s something humbling about being in the presence of creatures old enough to remember the Dark Ages, especially when they grow taller than the Statue of Liberty and thicker than a city bus. 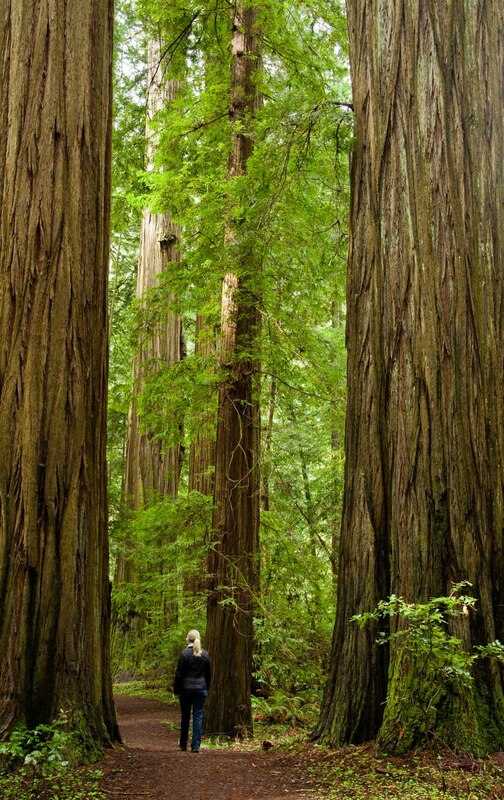 We’ve seen these majestic redwood trees all along the California coast. In fact, it’s hard to miss them. 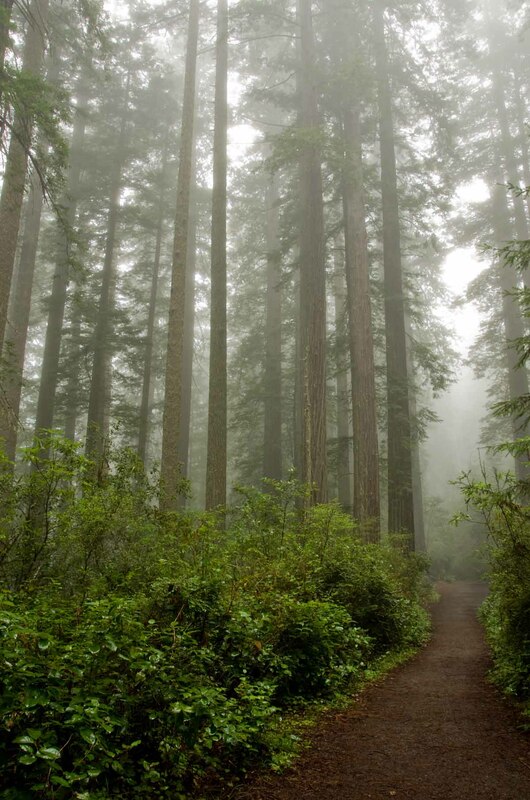 But it’s in Northern California, with its moderate climate and blankets of fog to help hydrate all those hundreds of feet of height, where they grow tallest. So it’s there where we decided to settle in for a couple of days to explore the preserved groves of Redwood National Park and Humboldt Redwoods State Park. Our first trip took us fifty miles or so along California State Road 254. 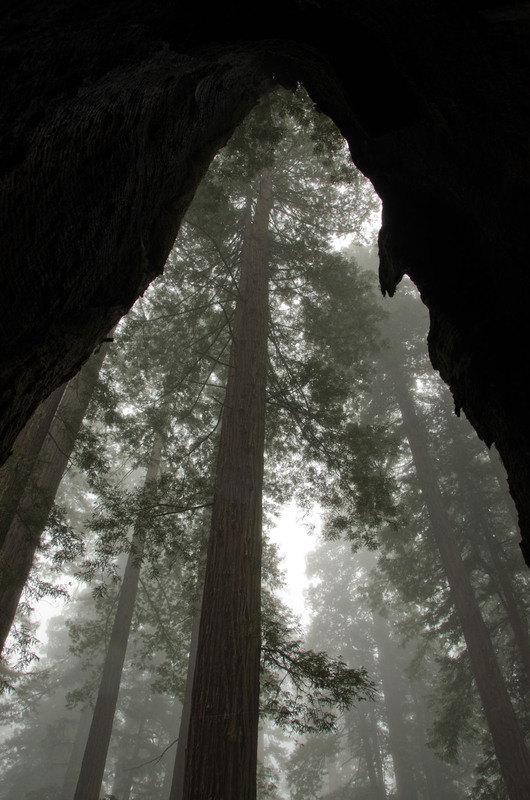 Also known as the “Avenue of the Giants,” we expected plenty of redwoods. But we also found other surprises, like wonderful tunnels made from moss-covered branches. 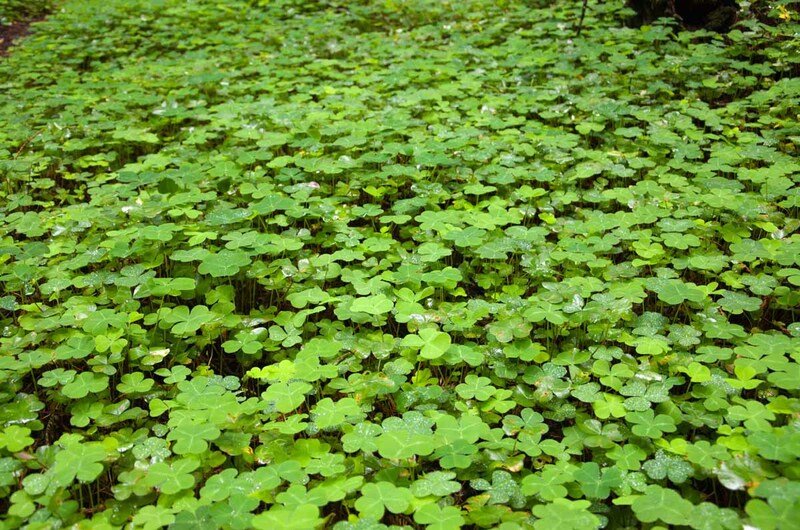 Entire fields covered with clover. And, of course, miles and miles of enormous and ancient trees. 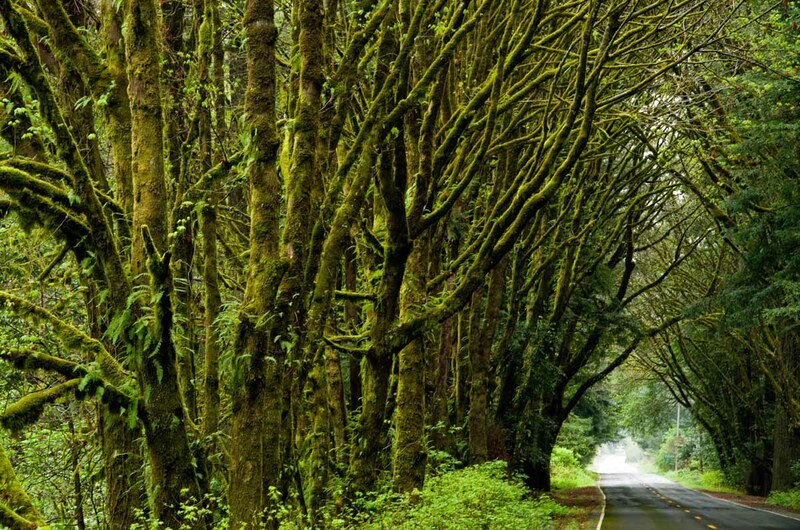 We expected more of the same when we ventured further north to Redwood National Park. So when the weather turned from sunshine to drizzle and dense fog, we contemplated not even going. That would have been a huge mistake. The fog changed the entire mood of the forest. Instead of exploring another bright and lively grove we found one transformed into something darker, quieter and a bit creepy. 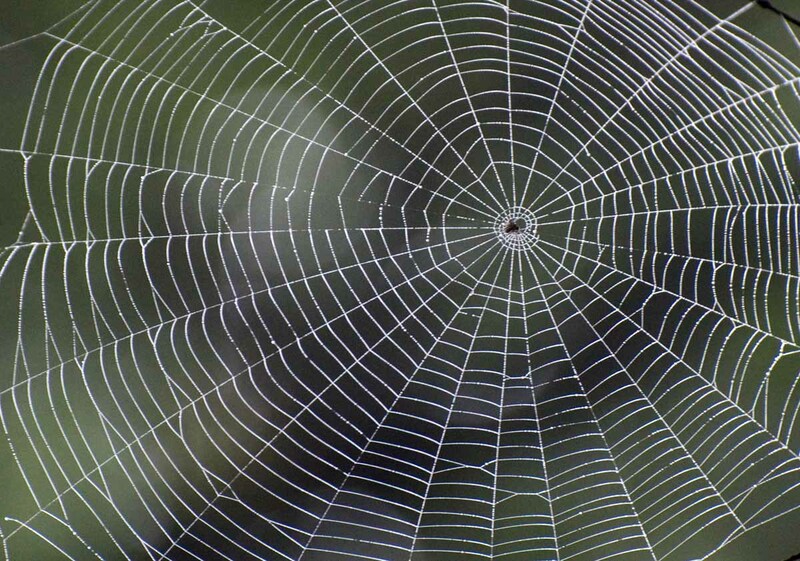 Even the spiders played their part, decorating the woods with giant webs as if preparing for Halloween. I don’t know if we simply missed them in Humboldt, where we didn’t notice any, or if they were made more visible by a fresh sheen of mist, but now we saw them everywhere. Two days, two completely different experiences, one great and awesome form of life. I love these images. Really evocative. Wonderful shots – the foggy scenes very evocative. This is awesome! Thanks for stopping by. I’m glad you enjoyed it. Amazing!! I’d love to go to see the trees in person one day! Great pics thanks. Making me want to go travelling!! Indeed it would have been a mistake. I even consider driving all the way down from Oregon when I know the weather might be misty. In cold clear weather in winter you can get fog in the morning, which breaks in late morning. The sun rays are amazing. Hope you all are having a great time. These are so great! A reminder of how powerful and moving nature is. Gorgeous photos! I love the fog, very glad you went! Spectacular! I see a tortured twisted face on the tree trunk in the first picture. Amazing. And I do love a forest with a misty fog. Creepy it may be, but awesome in so many other ways. Thanks for posting this amazing photos. I would like to get back to the Redwood forests. I haven’t been there in years. Thanks for the post and very nice images! The redwoods are probably the thing I miss the most about the US (burritos are a close second). Thank you for the shots of them, they’ll hold me over until I can get back and spend some time in those cathedrals again. Great photos! 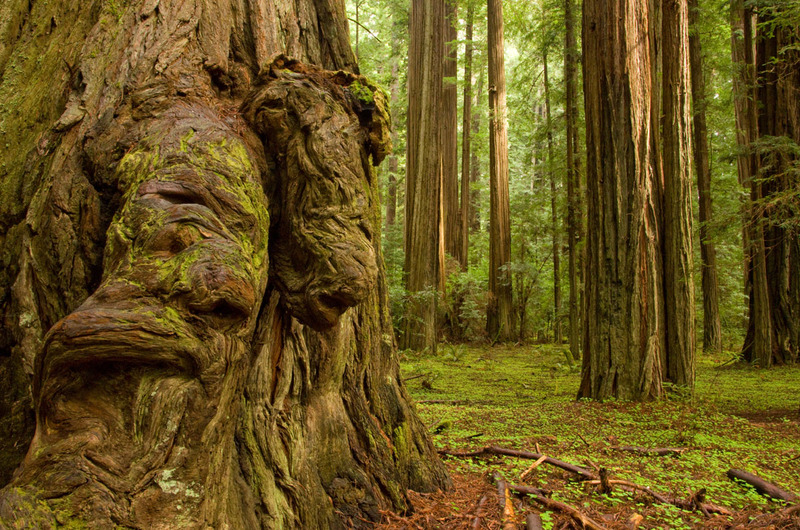 I’d love to visit the Redwoods some time — its at the top of my national parks to visit list. Thanks for sharing! The Redwoods are on my list. Great photo of Shannon walking among the Redwoods. I find it so difficult to get shots that show the size and grandeur, but you’ve done it there. Thanks for stopping by my blog. Great photos. I grew up around there. I remember one when my parents were really late picking me up from a Girl Scout adventure; and the fog was whirling in amongst the Great Trees and I was really scared…….something I won’t ever forget! Super photos. A wood in the fog is definitely an eerie place! Gorgeous photos. You show the trees well in all their glory. I love trees.